How To Use Beta-Alanine: Train Harder With This Unique Amino Acid! Exercise physiologists recently made a quantum leap with ground-breaking research on the role of beta-alanine. Just like creatine, this amino acid has great potential in the area of strength and recovery. "Evidence supporting beta-alanine’s efficacy is abundant." If you could train harder and longer, what could you achieve? Thanks to scientific research, we have real information to guide us, not science-fiction! Exercise physiologists recently made a quantum leap with ground-breaking research on the role of specific performance-enhancing supplements. At the center of this research is a special type of amino acid called beta-alanine. Just like creatine before it, the evidence of its efficacy is abundant. The studies that show the incredibly powerful effects of beta-alanine were performed with humans, and not data interpolated from rat studies, unlike many other supplements trials. 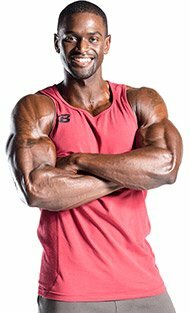 Research iindicates that beta-alanine may be a unique, powerful, and very useful addition to practically anyone&apos;s supplement program. However, the most exciting news is that beta-alanine has exponential synergism with other heavily researched supplements such as creatine and BCAAs. Why is this so exciting? Because if the research is correct, these supplements may produce massive improvements in your performance when stacked and applied correctly. Get ready, because the future of human performance enhancement is here. 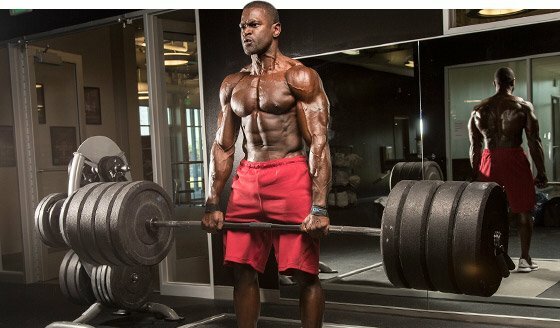 What Can Beta-Alanine Do For Me? Beta-alanine is a naturally occurring amino acid that significantly increases strength, lean body mass and muscular endurance by helping to manage the pH of the muscle cells. In other words, it helps buffer the acidic buildup that can occur in muscle, which allows you to maintain your strength, speed, and power for a longer period. In essence, you can train harder and longer because of it. There is also plenty of evidence to show that it is incredibly synergistic with creatine. Therefore, when used/stacked properly, this new supplement can be an amazing tool to help you take your training to new levels, resulting in new personal records and added lean muscle. Beta-alanine and histidine combine in the body, increasing the level of an important dipeptide called carnosine. Carnosine is important because it helps keep your muscles from becoming too acidic. Nearly 20 percent of the muscle&apos;s pH-buffering capacity comes from this compound. Beta-alanine is the precursor of carnosine, and carnosine levels are limited by the amount of beta-alanine your muscles have available. Studies have shown that supplementing with beta-alanine increases muscle carnosine concentrations, which decreases fatigue in athletes and increases total muscular work performed. This happens because muscles function best in a very narrow pH range (See graph). Exercise can quickly cause an increase in the acid level of your muscles. When this happens (acidosis), muscular performance suffers and muscle cramps happen much easier. Furthermore, if the pH drops too low, muscle work stops completely. 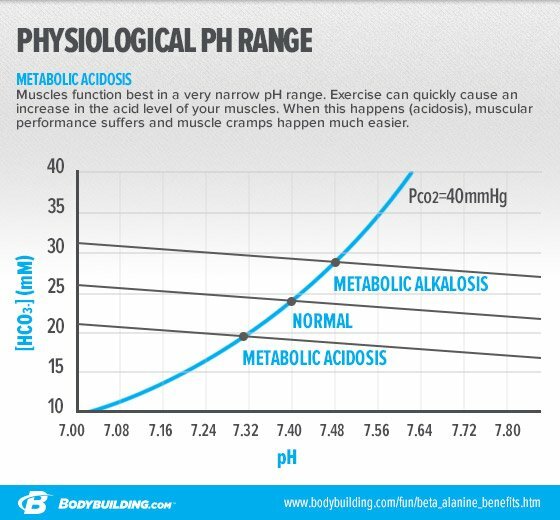 So, keeping your muscles in an optimal pH range is immensely important. Staying in this optimal range allows your muscles to keep contracting at the same power level for a longer duration, enhancing strength, speed, and endurance. A researcher, Dr. Roger Harris, believes beta-alanine can double the buffering capacity within your muscles. This is a huge statement with big implications for every type of athlete. Dr. Harris backed up his theory in a study he conducted where he reported a monstrous 64 percent rise in muscle carnosine levels after just four weeks of daily beta-alanine supplementation. Subsequent studies confirmed his results, with one study showing that after 10 weeks, muscle carnosine increased by an average of more than 80 percent! Other studies showed a very significant 16-percent boost in total work capacity performed on a stationary bike. This research shows us that beta-alanine is extremely effective in fighting fatigue by boosting the body&apos;s energy systems and vastly increases endurance. So why not just take carnosine? Carnosine is digested very poorly. When you ingest it, the body hydrolyzes (breaks it back down) it into beta-alanine and histidine anyway. Then your body synthesizes it back into carnosine again. Since your body usually has plenty of histidine already, it makes much more sense to just take beta-alanine. As you are starting to understand, boosting Carnosine levels with beta-alanine is extremely beneficial for athletes. It is very useful for anyone involved in athletic activities where strength, power, and muscular endurance are needed. It&apos;s for athletes participating in weight training who want to increase strength/lean body mass as well as athletes participating in speed or endurance events who want to prolong the onset of fatigue. It is also helpful for anyone who has hit a training plateau and is looking for something to bump them to the next level. The research on beta-alanine suggests it is a powerful supplement that, when combined with specific other supplements, may significantly increases strength, lean body mass, power, and muscular endurance. Research also showed that supplementing with beta-alanine for as short as four weeks with as little as 1.6 g per day had a dramatic effect on athletic performance in numerous categories. It also showed that supplementing with beta-alanine for a longer duration with higher dosages (12 weeks or more at 3.0 g/day or more) had an even greater effect on performance. Furthermore, these same studies showed the best results occur when using beta-alanine consistently for at least three months. There was no evidence to suggest that cycling off beta-alanine would be necessary or beneficial. The combination of beta-alanine and creatine was synergistic and increased workout volume, increased lean muscle mass, and may have reduced body fat. 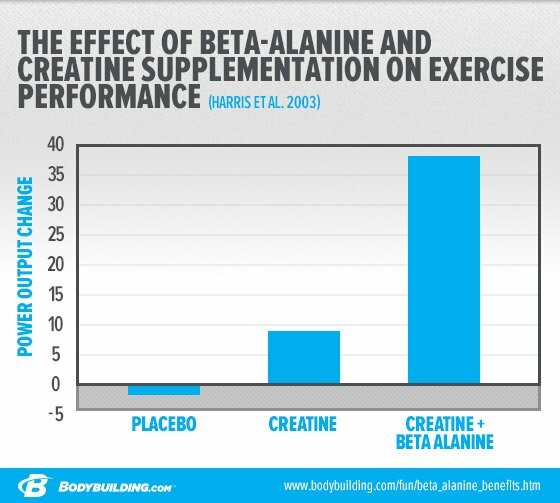 Combining creatine and beta-alanine had a dramatically positive effect on performance for explosive-type movement (sprinting, weight lifting, etc. ), as evidenced by a significant increase in power output over creatine alone. As indicated above, there is a synergistic effect when stacking creatine and beta-alanine. There is almost certainly an even greater synergism when you take other research into account on amino acids, protein, and glycogen replenishment. Many athletes report a "prickling sensation" (pins and needles) called paresthesia when using a serving larger than 1000 mg at a time. The prickling is a result of beta-alanine binding to nerve receptors, activating them and causing them to discharge/fire. This sensation may begin approximately 15-20 minutes after ingesting beta-alanine and may continue for 60-90 minutes. Furthermore, Dr. Stout found in his research that one large dose didn&apos;t work as well as divided doses. Many athletes experience intense vasodilation/pumps from beta-alanine if they take more than 1000 mg at a time. While this may feel good for some, it usually causes most people to stop their reps or sets short because of this "pump" feeling. "Many athletes experience intense vasodilation/pumps from beta-alanine if they take more than 1000mg at a time." This means less work was actually performed and less adaptation will occur, thus diminishing the training effect and subsequent results. To illustrate this point, think of a cyclist whose legs get too pumped going up their first hill. As a result, they fatigue early and perform worse. Using the proper dosage and the right timing will help avoid this scenario. Harris RC, Dunnett M, Greenhaf (1998) Carnosine & Taurine contents in individual fibers in human vastus lateralis muscles. J Sports Sci 16: 639-643. Hoffman J, Ratamess N, Kang J, Mangine G, Faigenbaum A, Stout J., Effect of creatine and Beta-alanine supplementation on performance and endocrine responses in strength/power athletes. Dept. of Health and Exercise Science, College of New Jersey, Int J Sport Nutr Exerc Metab. 2006 Aug;16(4):430-46. To pack on 50 pounds of muscle you can&apos;t just gobble junk. You must eat right, exercise, and balance it all with proper supplementation. Like Carl did! There&apos;s a new pre-workout star on the rise. Get behind the label of your favorite supplements and see what this promising ingredient can do for you! Supplements are here to stay, but not everyone is on board. If you or a loved one hasn&apos;t gotten on the wagon, test your skepticism with these four well-researched nutraceuticals! John Scott's Nitro® is a company built by athletes for athletes with a reputation for integrity and quality products. Learn more!